First, it was the fallout of September 11 and the economic downturn, then the Iraq war and fear of further terrorist attacks. Then there was a widespread concern of SARS to hurt the airline industry were all add up to unfavorable market conditions. Airlines are struggling for ways to maintain and increase profitability in a WJStable economy. So what are the airlines doing to help our customers increase margins and /or market share? For one. 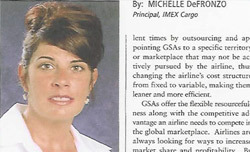 more and more airlines are looking resource their cargo sales to General Sales Agents. Airlines arc said to be taking a more Serious look at appomnng GSAs as a pan: or total replacement for their own cargo offices and operations. Many airlines have large scale financial problems and arc being forced to cut costs. Air carriers are making smarter opcracional decisions during these rurbulent times by outsourcing and appointing GSAs ro a specific territory or marketplace that may not be acridly pursued by the airline, thus changing rhc airline’s cost structure from fixed to variable making them lener and more efficient. GSAs offer the flexible resoarcefulness along wirh the competitive advantage an airline needs to compare in the global marketplace. Airlines arc always looking for ways to increase marker share and profitabiltty. By outsourcing offline territories ro a GSA, the airline can apply valuable time and energy focusing on the gateway of depamrre for business. What makes 011 airline/ General Sales Agent relmionsbip work? A General Sales Agent is an extension of rhe airline. In order ro make the relationship successful, ir has cowork in partnership as a srraregic alliance with the carrier focusing on shared commissions, communication. joint marketing efforts, and accountability. GSAs can represent cargo airlines by providing local sales and service in a market area dur m.ay nor be actively pursued by the airline. They can considerably strengthen a cargo sales work within IRS appointed territory, providing enhanced exposure and increased marker share. ln the past, some cargo agents regarded GSAs as inferior to the airline until they became aware mar they were working with a skilled and reliable.